Keyboards - Bargains, blow outs, remaining stock and returned items. All items that have not been sold will be further reduced after one month. The Yamaha Arius YDP-143 digital piano provides authentic acoustic piano touch and tone suitable for any aspiring pianist. The Graded Hammer Standard (GHS) keyboard action helps build proper finger technique and strength for an easy transition to playing on acoustic pianos. Improved Pure CF Engine delivers expressive, high resolution recordings of the Yamaha CFIIIS concert grand piano. Damper Resonance digitally recreates acoustic piano depth of tone when pedaling, while newly improved reverbs set the stage for you to replicate the feeling of playing in a variety of different environments. The Pure CF Sound Engine is the result of many years of piano-making history and expertise, combined with state-of-the-art sampling technology. Yamaha is the industry leader in digital piano technology, and this is evident when listening to Yamaha digital pianos that utilize the Pure CF Sound Engine. The sound of the renowned Yamaha CFIIIS 9’ concert grand piano is faithfully reproduced, allowing for incredible dynamics and expressiveness, making Pure CF-equipped digital pianos worthy of the Yamaha name. 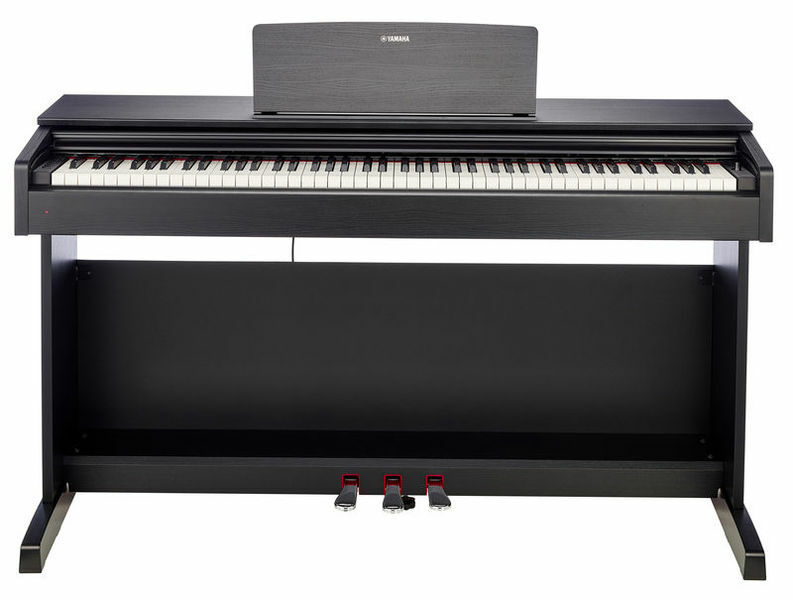 A Graded Hammer Standard (GHS) 88-key piano keyboard provides a heavier touch in the low end and lighter touch in the high end, and is similar to the hammers inside an acoustic piano. GHS is great for the aspiring pianist, because practicing with the GHS action builds proper finger technique for playing on an acoustic piano. Additionally, the matte finish of the black keys makes them less slippery when playing for extended periods of time. Half-damper pedal control creates more detailed nuance and subtlety when playing, similar to pedaling on a grand piano. This feature allows for continuously increasing lengths of sustained notes, from slight to full, as the sustain pedal is depressed.Stereo Sustain samples provide mellow reverberations when the player depresses the damper pedal. Similarly, Damper Resonance provides broad and deep resonance when the pedal is used. The result is more realistic sound, similar to that of an acoustic piano. It is possible to detect the subtle changes that occur when the players begins to press the pedal while striking a key. The Yamaha digital piano is pre-loaded with a variety of classic piano songs for listening and learning pleasure. Players can use the accompanying book, "50 Greats for the Piano" to follow along with the music and learn how to play iconic pieces. They can also play back the songs to enjoy these recognizable piano favorites. This feature is sure to add hours of enjoyment to this terrific instrument. The recording function built into the instrument allows players to record performances* with a single touch. Additionally, players can record up to 2 tracks for simultaneous playback, meaning that both hands can be recorded separately, or allowing them to overdub with different voices. "Digital Piano Controller" app with an attractive interface optimized for iOS touch screens adds a whole new level of functionality to your Yamaha instrument. Turn your iOS device into an intuitive instrument controller, allowing you to access features and settings even more quickly than using the panel of your instrument. Adjust settings, choose Voices, and even record performances. Once you try it, you’ll never want to live without it! Combine two Voices together, like piano and strings, for an inspiring new playing experience. Nothing livens up piano practice like playing a piece with a different sound, and creating unique combinations of two sounds together. Experiment with these combinations to discover inspiring new sounds. With the Yamaha exclusive Intelligent Acoustic Control (IAC) feature, people can enjoy playing their digital pianos at a lower volume in a quiet home environment. Before IAC was introduced, playing at a low volume resulted in a loss of treble and bass. With the addition of IAC, the instrument automatically adjusts the balance of bass and treble, creating a truer sound with more depth. Additionally, the volume dial automatically makes fine adjustments to the overall sound of the speaker system (EQ) when played at a low volume. This ability to retain a rich and balanced sound on the digital piano, regardless of volume, ensures the highest sound quality. Yamaha developed this new technology with an in-depth knowledge of the acoustic properties of musical instruments. Acoustic Optimizer delivers naturally smooth tonal richness across the entire keyboard by regulating the flow of sound and control of tone from the cabinet of the instrument. The Stereophonic Optimizer is unique to Yamaha. When playing and listening to the instrument using headphones, the Stereophonic Optimizer adjusts the spacing of the sound and the separation from the piano, resulting in a spacious, surround sound quality that will inspire you to play for hours at a time. Within this private listening environment, the sound of the piano can be perceived to come from the body of the instrument rather than from the headphones, providing a more realistic and natural experience. A standard USB cable can be used to connect the instrument to a computer or mobile device, opening up a world of creativity, entertainment, and education. iOS devices can be connected to the instrument using the Yamaha UD-BT01, or the Lightning-USB Camera Adaptor. The instrument can be used to interact as a controller and/or sound source with a variety of music creation applications.